I had a place in the Lewes Downland Ten, which was run this morning. I was sorry not to be able to use it, because of family commitments, and reasons of state. Instead I ran a very short local run. The forecast for the Lewes event was poor, and threatened to be like that terribly rainy and windy running of the event around ten years ago.In the event, conditions were not so bad, though it was probably muddy in Ashdown Bottom. Well done, all those who took part, especially the Seaford Striders. 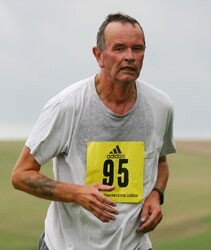 On Saturday, I ran my favourite parkrun, that at Bevendean Down. It was a historic day. a runner, James Baker, known to me from the Sussex Grand Prix, turned up, and, though he was due to run in a cross-country event at Goodwood that afternoon, stormed round the course to break the course record by a minute, finishing in 16:30. As I was finishing my first lap, I felt the slightest movement of air, as James, on his way to complete the race, passed me effortlessly. My own performance was poor. It’s not about times, they say. But it is. My plan for this year was to run few races, but to run races of substance, so in each quarter I would run a ten-miler, or half-marathon. Looking back through the year so far, it has not been straightforward. The first quarter was dedicated to the Brighton Half Marathon, which went according to plan; in the second, I was to do the Seaford Half Marathon, but, with a dodgy knee, had to substitute the half marathon that makes up a part of the Seaford Martello Triple Challenge event. In the third quarter, it should have been the Bewl 15, which again I missed because of injury, and substitute the Erdige Ten Mile Trail. As for the final quarter of the year, today’s race should have been the one. So I have now entered the Downland Devil, a nine mile race in West Sussex in early December. As for 2018, I have a charity place in the Brighton Half Marathon, running to raise funds for the Brighton and Sussex University Hospitals NHS Trust Charity.